Abt Schaeffler’s Daniel Abt proved to be the strongest driver in Super Pole after leading an intense qualifying session and will start the Mexico City ePrix on pole ahead of Oliver Turvey and José María López. Group one saw a few surprises as Buemi ran wide in his first attempt and only managed third place, behind an impressive Nick Heidfeld, who ended the group as the leader, and DS Virgin Racing’s Sam Bird. Meanwhile, Lucas di Grassi only could be fifth behind Mitch Evans. Afterwards, the drivers complained about the track seeming to be really lacking grip. Group two saw Antonio Felix da Costa, Abt, López, Stephane Sarrazin and Turvey on track. Abt was the first one to go for 200kW, and climbed to the top followed by Lopez in solid shape in his first attempt. 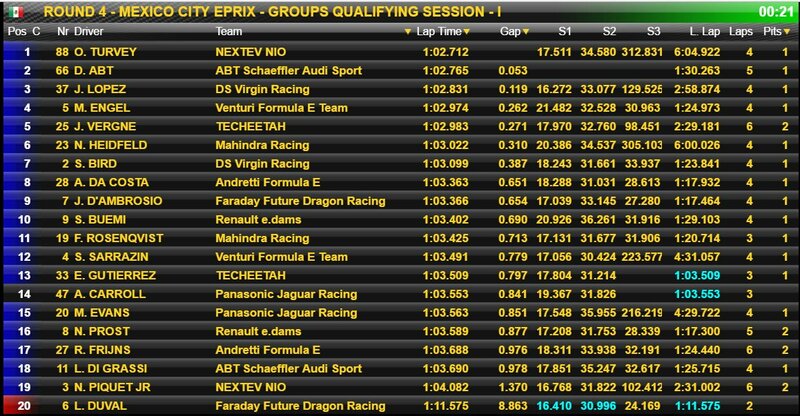 Turvey beat them all to grab P1 in his attempt with 1:02.712, pushing championship contenders Buemi and di Grassi out of contention for Super Pole. The first red flag of the session was shown not long after group three went out: Jean-Eric Vergne, Loic Duval, Robin Frijns, Nelson Piquet Jr and Nicolas Prost came out before the Faraday Future Dragon Racing of Duval spun off when approaching turn one and crashed into the barriers. Only three minutes were left when the green flag let the session resume. Prost looked a serious candidate, but lost more than half a second in sector two and only managed to be tenth. Meanwhile, the Techeetah of Vergne showed up as the best of the group, moving up to fourth just 0.271s behind Abt, who was still at the top of the standings. Lastly, Group four had Jerome d’Ambrosio, Maro Engel, Esteban Gutierrez, Adam Carroll and Felix Rosenqvist looking for a spot in Super Pole. Rosenqvist was surprisingly off the pace and managed ninth on his attempt, but Maro Engel showed much better and did a very strong lap that placed him in fourth, ensuring him a spot in Super Pole. Vergne, Engel, López, Turvey and Abt moved forward to battle for pole. 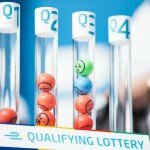 After all their issues and victims of a changing track, Buemi and di Grassi finally qualified tenth and 18th respectively. Vergne was the first to go for his lap in the Super Pole session. The Frenchman set a 1:03.272s, which didn’t seem to be as fast as he was during the qualifying session. As for Engel, the German driver was slower in sector one, but improved in sectors two and three, ending his lap in 1:03.045s. Lopez was next, and the Argentinian driver was quickest in the first two sectors, but couldn’t improve in the last one, and placed 0.027s behind Engel in second position. Abt looked really strong in sector one, and confirmed it in sector three, despite a little time loss in sector two. The German driver moved up to first place with 1:02.711s. It was all up to Turvey to topple the ABT Schaeffler driver from the top spot. The British driver did well in the first sector, but lost a little bit of time at the end and managed to grab second position, losing out by a very narrow margin. 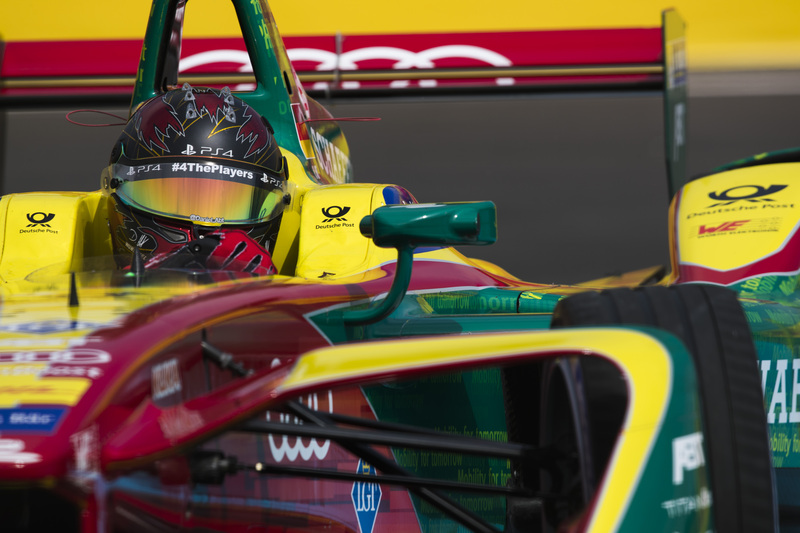 Therefore, Abt got his first pole position of the season, and his second one in his Formula E career. 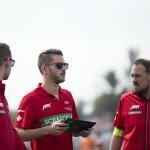 Engel has a ten place penalty for the grid, so he will drop down to P13 on the starting grid, an Abt and Turvey will share first row for the second Mexico City ePrix.